Hey everyone! 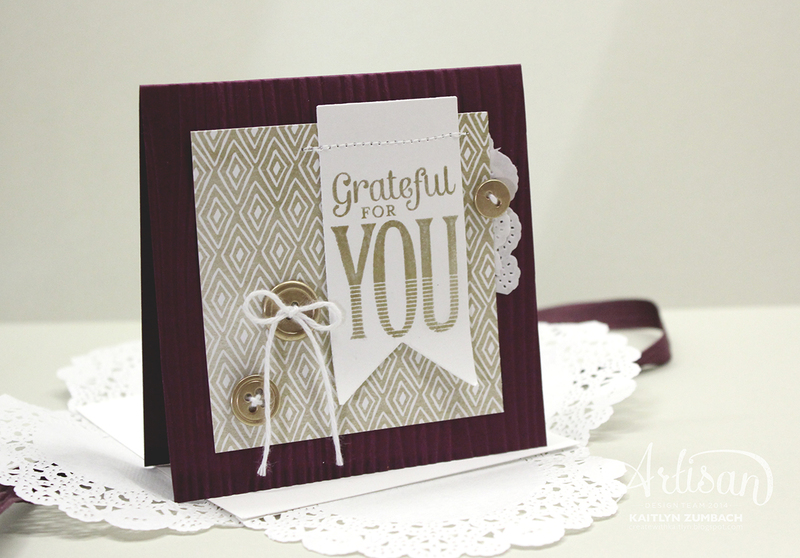 It is time for another Artisan Design Team Blog Hop! This week we are diving into our October box of goodies. It is simple to visit all 16 of us. Just hit the "Next" button at the end of each post until you are back to where you began! I have been wanting to make an envelope with doilies for a while, but it never seemed to work. That is until now! Isn't it super pretty!?!? To make it even better it was super easy to make! You will want four Paper Doilies and 4" square of Whisper White Card Stock. Fold the doilies in half and attach them to the card stock so that edge of the card stock is on the fold. The Transfer Adhesive Sheets are great for this! 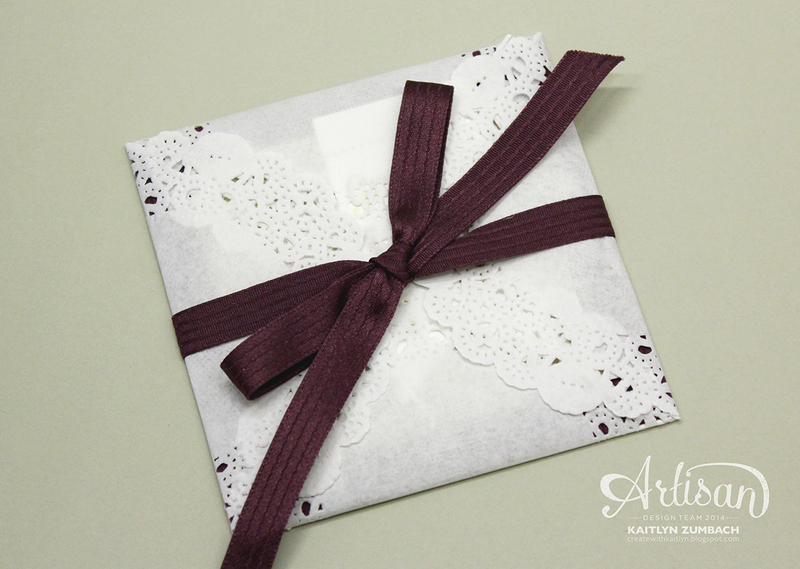 I attached a piece of Blackberry Bliss Stitched Satin Ribbon to the back of the envelope to use as an easy closure. You will want to make you card a tiny bit smaller than 4"x4" so that it fits nicely inside. I love this simple card just as much as I love the envelope! The Color Me Autumn Designer Series Paper is a fun relaxed pattern that pairs nicely with the Gold Metal Buttons and the gold sentiment from the Merry Everything stamp set. I added a touch of Paper Doilies to connect the card to the envelope. Remember to click the "Next" button below to continue the hop! So beautiful Kaitlyn! I love doilies and your envelope is adorbs! Great idea ! Wonderful ! super pretty, love the use of the doily! 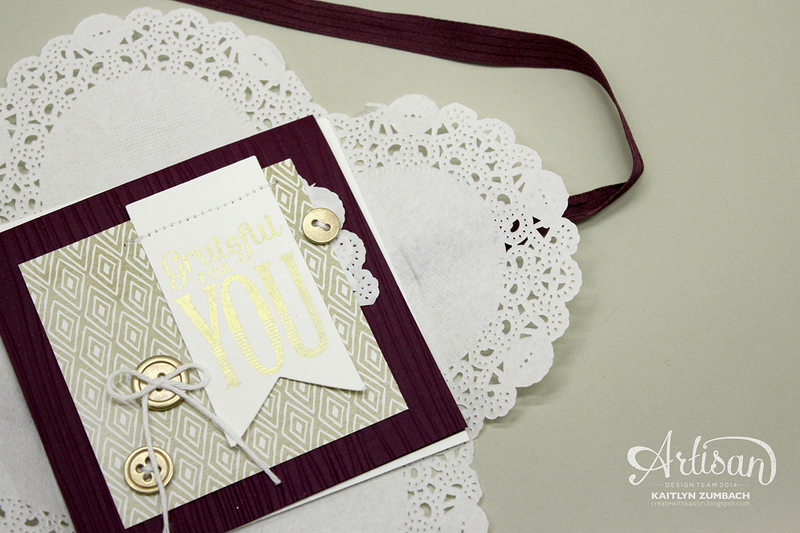 What a great idea for the envelope, and what a wonderfully elegant card!